The archives of the Association of Jews in Belgium (AJB), donated to the Jewish Museum of Deportation and Resistance by the Martin Buber Institute, contain almost 3,500 documents which cover over 40 topics, including : copies of German decrees, the statutes and procedures of the AJB, files of the general and local committees (Brussels, Antwerp, Liège and smaller cities), interventions by the AJB with the German authorities, population registration, Jewish schools and children’s homes, the Arbeitseinsatz (forced labour) for Organisation Todt (France), convocations for the SS-Sammellager Mecheln / Dossin barracks (including release or visit requests), correspondence received from camps in the east, Jewish property and economy, elderly and childcare, mixed marriages and research on Arian descent, Jews with special status (Hungarian, Russian and Turkish), social welfare, prisons, the Breendonk camp, Commission for Public Aid, the German-Palestinian exchange, correspondence with organisations or persons abroad, with the Public Safety Office and with Belgian authorities, interventions, the Jewish Placing Service, Red Cross, Winter Aid, financial records, contributions, gifts, Sperrstunden Ausweiss, German documents and post-war documents. The collection also includes the journal of AJB leader Salomon Van den Berg and a report by AJB leader Maurice Benedictus on the situation of Jews in Belgium in 1940-1942. A rudimentary inventory on file level is available upon request. Item descriptions were drafted by dr. Laurence Schram. 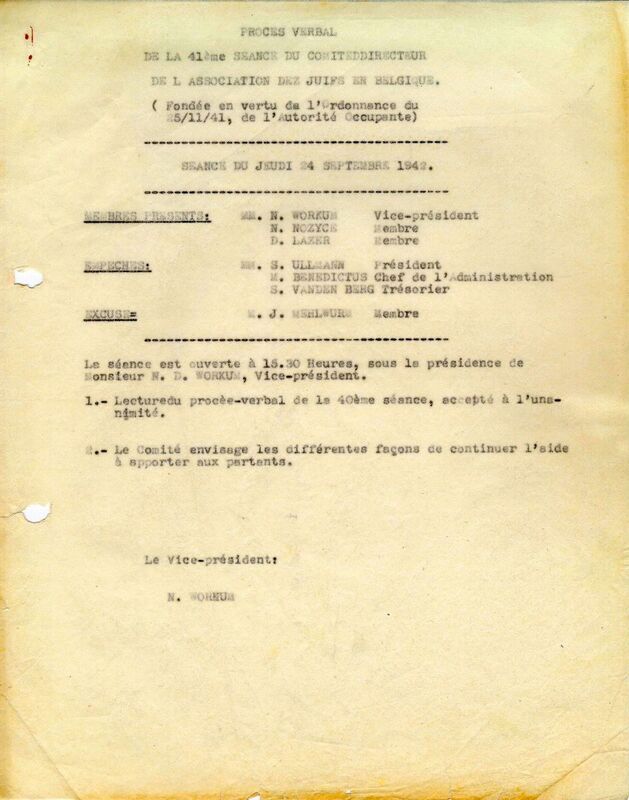 The Association of Jews in Belgium (AJB) created these files while carrying out its duties from 1941 until 1944. After the Liberation, in the context of the judicial investigation against the AJB and its leaders, the Military Prosecution confiscated the archives of the Association. Eventually, the investigation was abandoned without further legal action. The General Prosecution then stored the confiscated files, before donating them to the Centre National des Hautes Études Juives (CNHEJ) in Brussels. For decades, the files were not accessible for researchers despite efforts made by Mr Katzenelenbogen to reorganise the collection and create an inventory. In 2001, with the help of the Jewish Central Consistory of Belgium, the CNHEJ, today the Institut Martin Buber, donated the original AJB files to the Jewish Museum of Deportation and Resistance, predecessor of Kazerne Dossin, which organised, archived and digitised all the files. The files were organised per topic. A rudimentary inventory on file level is available upon request.